Camille and her fiancee Rajeev had a philosophy class together but never really got around to talking much. They didn't see each other for a semester but reconnected when they were each invited to a mutual friends party in 2003. 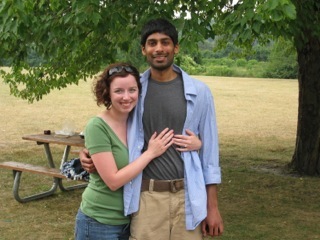 They dated for five years and on August 22, 2008 Rajeev popped the question! Rajeev went through a lot to find the perfect ring for Camille. Through extensive research online, Rajeev came across The Chicago Diamond Exchange where he then had to sneak away to Chicago to create the perfect ring. After all the preparation and planning Rajeev took Camille to a picnic in Gallup Park with her favorite food and dessert and that is where he asked Camille to marry him. Camille and Rajeev will be having a traditional Indian Ceremony at the Bharatiya Temple in Troy on Saturday, May 26th followed by a traditional Christian Ceremony and the reception held at The Royal Oak Music Theatre. They have a wedding party of 10 people and their wedding colors are purple and silver. The couple has chosen to use the park where they got engaged as the theme of their wedding incorporating branch centerpieces, imagery of them on invitations, and a topper of the couple under a tree for the cake. You're The Bride will be providing day-of coordination and is looking forward to celebrating this day with such a wonderful couple! They're wedding(s) were simply gorgeous!